This post continues a series re-capping insights from Alexandra Radcliff's book, The Claim of Humanity in Christ, Salvation and Sanctification in the Theology of T. F. and J. B. Torrance. For previous posts in this series, click a number: 1, 2, 3, 4, 5, 6, 7, 9, 10, 11. 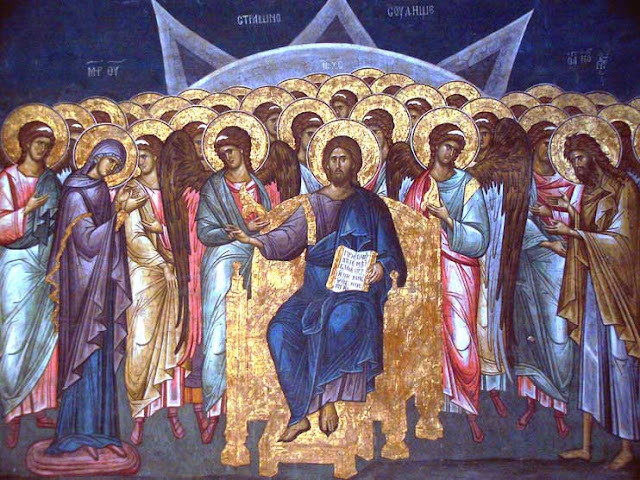 A Radcliff notes, the Torrances' participatory view of salvation is akin to the Eastern Orthodox doctrine of theosis (sometimes termed deification or divinization), which emphasizes that, in union with Christ and by the sanctifying work of the Holy Spirit, we truly are (and are becoming) children of God in the fullest sense. That does not mean that we are becoming God (who alone is uncreated), but that, as humans, we are being fitted for glory when we will share, with, in and through the human person Jesus, and by the Holy Spirit, in the divine nature. In that sharing---that ultimate participation---we will not cease to be human. We will always be creatures (created beings), but as glorified humans, we will be like the glorified human person Jesus, who now resides in heaven. As TF notes, by our union with Jesus (who is fully human and fully God) we share in Jesus' glorified humanity and in his divinity. Though we remain human creatures, in Christ and by the Spirit, we will commune with God in the most profound, deep way. As Radcliff notes, the Torrance view of salvation (including our being and becoming) is a "profoundly personal, relational, and participatory understanding... [one] that indicates a God whom humanity can not only know but experience intimately" (p. 119). Thanks be to God. For previous posts on the topic of theosis, click here and here.